Welcome to our new website where you can place your grocery and supply order from the Catlettsburg Boat Store! When you arrive, our delivery boat can bring your order right to you. How easy is that! Our family has been serving the river barge companies that ply the Ohio River since 1974. We have as our goal, to fill all orders as completely as possible and with brands you prefer, if available. We know you have a choice, so we want to provide you with the best service and products that will make your experience with us a positive one. If you haven't done business with us before, give us a try! You can email, fax, or phone your grocery and supply order in to the Catlettsburg Boat Store. Just click Here or click on Order Forms in our navigation bar for order forms, information, and instructions. 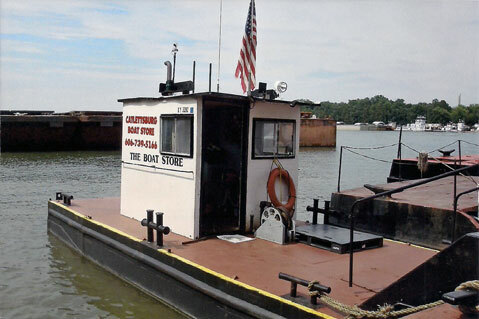 Be sure to visit our Towboat Treasures website for a unique and special collection of high quality towboat and nautical gifts, clothing, jewelry, home décor, collectibles, and more. We would love to see you there!